QUESTION: You mention the following comment recently. ”I am very concerned about are precious metals even going to be viable. Will this confiscation of wealth turn to those assets as well?” Could you expand on this please. ANSWER: This is merely my personal observation. India has virtually stopped the buying of gold there driving it underground. Many are trying to smuggle their gold out to Singapore where there are major storage facilities for Asia. We have seen laws in France banned buying or selling of gold in cash. The French even have limited ATMs. I could get 1,000 SF in Switzerland, 1,000 Euros in Germany, but only 200 Euros in France. Governments are tracking gold. Not to suppress the price, but to keep an eye on who has what. France just proposed a law making it illegal to close your business there. There are no guarantees any more because there is no rule of law. Governments are desperately trying to retain power. The IMF suggests raising taxes and in Europe seizing 10% of all assets. While the confiscation of gold by Roosevelt in 1934 did not involve a search house to house, today the NSA has everything. Snowden warned that they need only enter your name and/or email, and everything comes up from banks to phone calls. You do not gather this amount of information and store it because you are looking for 19 guys and a camel. They are doing this for money – yours. So honestly, all bets are off. Can you buy gold and store it in a safe-deposit box – hell no. That is illegal and can be interpreted as “money laundering” allowing them to just take it under current laws. They will be seizing all pensions. 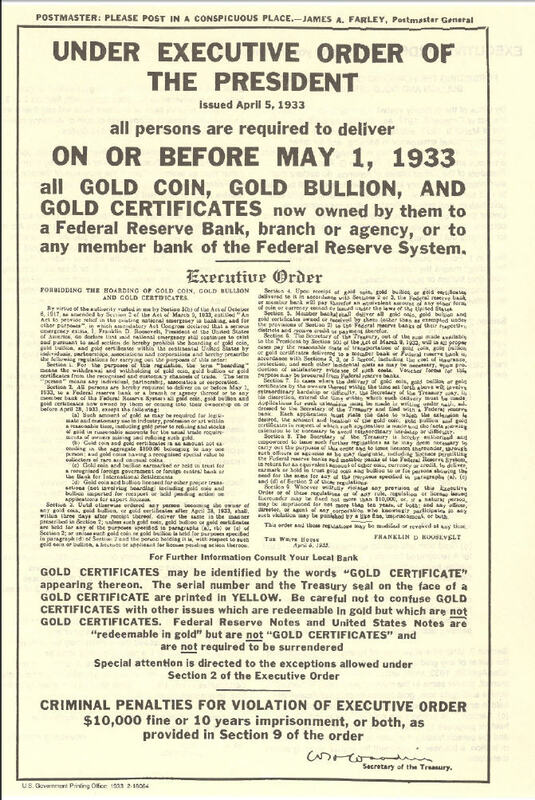 I cannot state with any degree of confidence that you can buy gold and not have to worry, The difference this time from 1934, they know who has what so they can target individuals rather than search every house. This is just my observation. I am concerned deeply about the future and this is why I even do this for free. The tree has been cut. Which way it falls depends upon how many realize the risks on the table and make some effort to educate others bringing them out of the fog. The world is full of obvious things which nobody by any measure ever pays any attention until it is too late, The Problem is clear. Government relies upon the simple fact that you may see with your eyes, but you do not observe either side of a linear path. The distinction is clear. Observe and survive, or pretend nothing is wrong and die in the chaos.